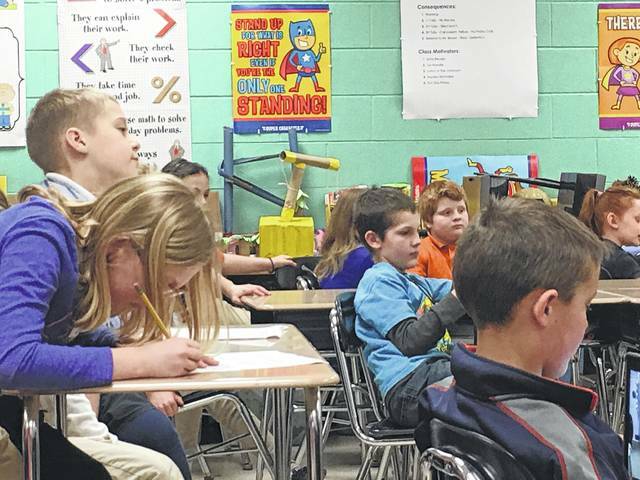 GALION — Third graders in the classes of Stephanie Kiger and Leslie Buzza at Galion Intermediate School were on pins and needles waiting for their guests to arrive Friday in Kiger’s classroom. The students have been learning about all aspects of recycling and as part of their curriculum and several students were given the opportunity to interview two prominent people in the community about recycling: their school superintendent, Jim Grubbs, and Tom O’Leary, mayor of Galion. “If we don’t recycle, our landfills will fill up,” said student David Hockensmith. Eight-year-old Tyler Ousley interviewed Todd Redmond who owns a local trash collection business. “They collect a lot of stuff and that will make our landfills fill up. If people recycle, it makes their business better,” said Ousley who then asked the mayor how recycling helps the city. O’Leary said one of the largest cost savers for the city when it comes to recycling is the reusing of road materials. “It is much cheaper to use recycled asphalt. We also re-use dirt from a hole we had to dig to fill in a hole at another location,” O’Leary said. Grubbs said the school system recycles everything possible, from paper and cardboard to aluminum, glass and plastics. “Our recycling program has reduced the amount of trash our district puts out. Recycling is definitely something we take seriously to protect our environment,” Grubbs said. Student Ivan Petty asked Grubbs how recycling affects the school economically. “Before we amped up our recycling program, our cost for trash removal was over $10,000 per year and now it is under $10,000 each year. There is definitely a cost savings for the district,” Grubbs said. Buzza said the students are writing five paragraph essays about the importance of recycling which will include information they learned from the question and answer session with O’Leary and Grubbs. “They also created projects using the roll from paper towels and other things they had at home that they could reuse came up with some really neat items,” said Buzza. Kiger said the two classrooms of third-graders are learning about recycling through their science, social studies and learning arts classes combined. Third-grade students at Galion Intermediate School are learning about recycling and have used paper towel rolls to create functional projects to use at home and at school. http://aimmedianetwork.com/wp-content/uploads/sites/38/2017/03/web1_recycling2.jpgThird-grade students at Galion Intermediate School are learning about recycling and have used paper towel rolls to create functional projects to use at home and at school.